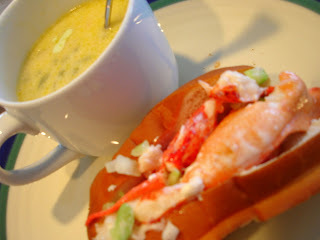 Mary Ellen's Cooking Creations: Lobster Rolls...fresh from Maine! My husband is from Maine and my father-in-law still lives there. Whenever he comes to visit we ask him to bring some fresh lobster meat. 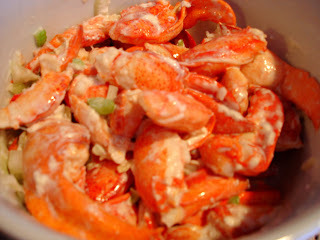 On the afternoon of Christmas Eve I made some lobster salad for lobster rolls. Of course for lobster rolls you have to have the special white-bread rolls only found in New England, so my father-in-law also brought them from Maine. I served the rolls with my corn chowder, my new favorite soup. My recipe can be found here.